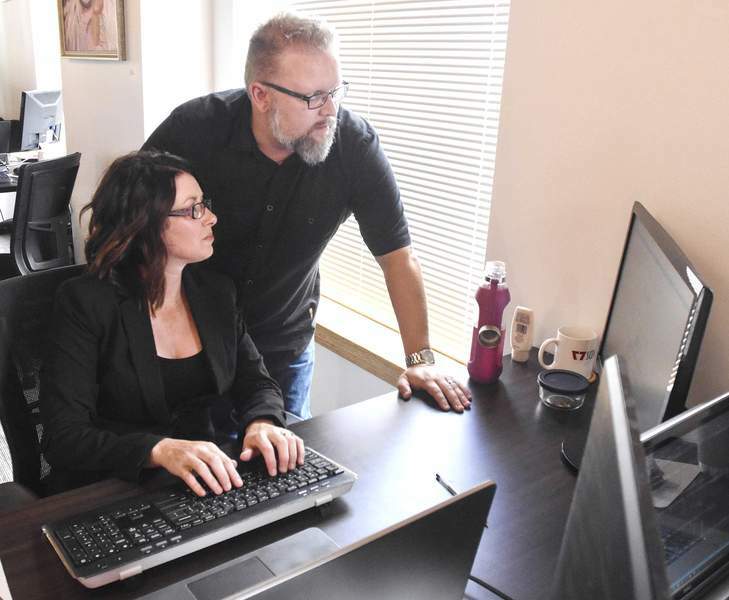 Michelle Davies | The Journal Gazette Jeremy Diller, owner of Scenario77, and his office manager and wife, Angela, review a website that he designed. When Jeremy Diller launched Scenario77 six years ago, he was the only one earning a paycheck from his custom software development firm. Today, Diller is one of six employees with the Fort Wayne business. He takes the lead on hiring – assuming he can carve out the time. “It can take a month or two to really find the right person,” Diller said last week. And hiring is just one aspect of the human resources function. But so far, particularly since Scenario77 doesn't offer employee benefits, Diller is able to manage. Some small businesses are finding they can't. Becky Robinson handled hiring, payroll and other HR needs when she started her marketing company, Weaving Influence, five years ago. But during periods when she focused on HR, the company's revenue took a dip. She realized she needed to keep her focus and turn those tasks over to a director of operations and an HR consultant. “The only way for us to grow is for me to delegate and not get bogged down in the details of HR,” says Robinson, a four-employee company in Lambertville, Michigan. Payroll provider ADP said small businesses added 50,000 jobs in July, which may mean owners are taking on more human resources tasks while also trying to get new business and develop products and services. A recent study released by ADP shows that at 70 percent of small businesses, HR is handled as a side job by the owner or a staffer with other primary responsibilities. In many companies, the people doing it don't have any HR training, says Brian Michaud, a senior vice president at ADP. Diller, owner and president of Scenario77, said hiring is the primary HR task that consumes his time; payroll is second. When a new employee is needed, Diller has had help from senior software developers he employs. He has an office manager who handles bookkeeping, works with an accountant and also with a labor attorney on labor agreements, legal and compliance issues. In the software development business, head hunters are common. But Diller said that's expensive, requiring 15 to 40 percent of the first-year salary offered to a new hire. To help employees with health care expenses, Diller said his strategy is to pay employees more so they can acquire insurance. As companies add employees and benefits packages, Diller knows there's a cost for administration. Human resources is complex work, a local training manager says. “Just like anything, when you get deeper into something you understand how complex things are, whether it's making a widget or doing HR,” said Brian Dumford, training manager at Fort Wayne Metals and president of the Northeast Indiana Human Resources Association. Managing human resources requires keeping abreast of laws and regulations. That's one reason Dumford said he's involved in the human resource association. It meets monthly provides some of the continuing education HR managers need. Plus, it helps to have a local support system. Rhonda Ladig, executive director of Start Fort Wayne, said the HR concerns usually surface in business's third to fifth year. They often launch with one owner or a couple of co-founders and when growth – along with more employees – comes, they suddenly realize they may not be doing the work they love that prompted them to launch a business. Start Fort Wayne, a nonprofit that helps entrepreneurs and small businesses, has a program called PowerUP that includes training to bridge the potential skills gap. Someone who starts a business may know the intricacies of operating it but may not be familiar with all of the processes required for employee benefits such as health care or family medical leave. Many colleges and universities offer degrees in HR, in supervision or in organizational leadership, Dumford said. But managers with “a strong passion for people and ability to learn” could be effective in human resources.